The selection of incentive plan performance measures and goals are customized to each particular company’s situation. 2 or 3 finical performance measures are commonly used. 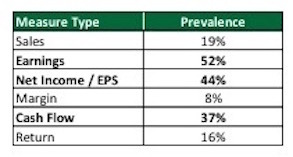 The most common measure types are earnings, net income/EPS, and cash flow. Earnings and net income/EPS metrics typically have the highest weighting, representing 60% of the target award opportunity on average. 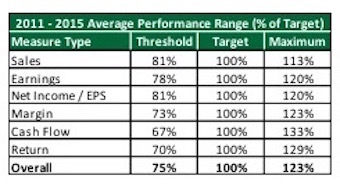 Performance ranges vary widely: most companies have ranges somewhere between 70% or target (Threshold goal) and 130% of target (maximum goal). The most common award payout range is 50% of target (threshold payout) to 200% of the target (maximum payout); however, there are wide ranges of practice – particularly for the threshold award level. There is no “right” or “wrong” and for many practices there isn’t a “never or “always”; rather, goals that fit the company's current realities anchored by a target goal that is, “challenging but achievable” with a range of goals that are reasonable higher or lower payout earned. In order to understand the financial performance measures, target goals, performance ranges, and payouts of an annual incentive plan, we analyzed the proxy-disclosed practices of approximately 100 manufacturing and materials companies. We assessed year-over-year (YOY) trends in particular, including the change in target goals relative to actual results and the spread of threshold to maximum goals. While the 5 years we examined had a generally upward-trending stock market, individual companies’ performance and business situations varied over the period. The analysis reflects the practices of 98 companies that disclosed at least 2 consecutive years of using the same financial performance measure in the annual incentive program and most or all of the performance-award goal range and results. The analyzed companies have median annual revenues of $3.8 billion and median market capitalization of $4.4 billion. These companies yielded 170 financial measures over a 2 to 6-year period, with approximately 80% of companies having data covering at least 4 years of goals and results. Most of the companies use 2 or 3 financial performance measures. Some companies also use non-financial measures, but these are not included in this analysis. The most common type of financial measures used are earnings measures (eg, EBITDA, Operating Income) and net-income-based measures (eg, EPS and net income), followed by cash flow. While it is beyond the scope for this analysis, we note that long-term incentive plans often have different measures than annual incentive plans — this reflects a holistic approach to drive shareholder value without undue complexity and overlap. For example, “return” and total shareholder return measures typically have higher prevalence in long-term incentive plans than in annual incentive plans. 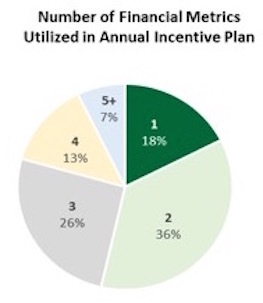 The heaviest weightings in annual incentive plans are typically assigned to earnings and net-income-based measures, which reflect their relative importance to the company. Companies strive to infrequently change the weightings of measures, resulting in limited differences over time in the observed average measure weightings. The typical practice is to set a range of performance goals with varying degrees of difficulty. The target goal is often set based on the Board-approved budget. For most of the companies, the target goal was higher in the examined period than in the prior year actual (prevalence: 68%). 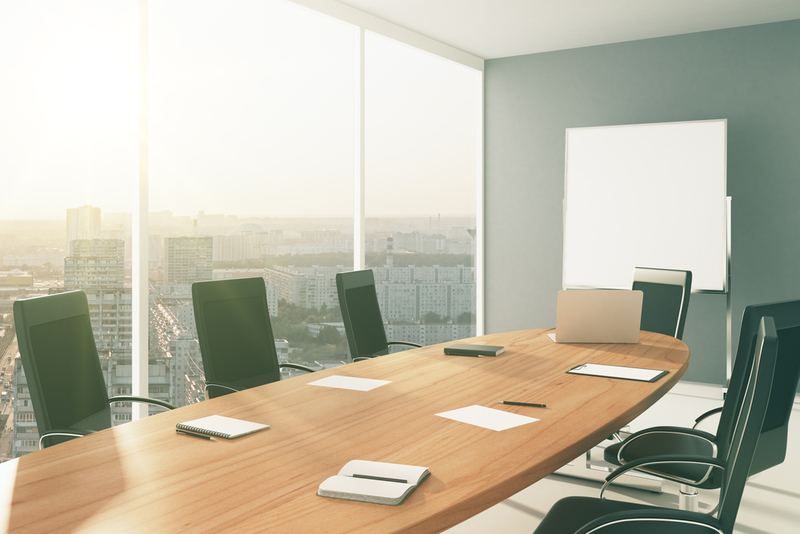 This is not always the case, as 74% of companies set a lower target goal in at least 1 year, reflecting business conditions, performance expectations, divestitures, and other factors. The threshold goal is typically lower than the prior year actual result (prevalence: 68%). The maximum goal is typically higher than the prior year actual result (prevalence: 87%). Approximately 40% of companies had fixed performance ranges as a percent of target for ≥3 consecutive years. The 2015 average performance ranges are somewhat different from the five-year average, illustrating changes that companies may apply year-to-year. Most years’ goals are higher than those of the previous year. However, during the examined period, 73% of companies disclosed at least 1 year when the target goal was set lower than the prior year’s (in such situations, it is important to consider providing additional proxy disclosure as to the rationale for the change in goals). Below is the median YOY change in financial goals over the examined period. In the most recent year, goals were typically higher than the prior year, with a higher YOY increase for metrics with relatively smaller absolute dollar-denominated amounts (eg, net income/EPS). Typical practice is to set the target goal to equate to a payout of 100% of the target award opportunity for the measure. The award payout ranges — spanning from the starting point for paying incentives (“threshold”) to the upper limit (“maximum”) — exhibit some variability across companies, particularly for threshold payouts. The variation in practices reflects differing company situations, goal setting philosophies, and other factors. o Fifteen percent of companies have a payout >200% of target (all award payouts are capped in all but 1 company, with the highest maximum at 300% of target). There is more variance in the threshold payout as a percent of target, with most companies paying between 25% and 50% of target (mode of 50%); threshold levels vary from 0% to 80% of target. 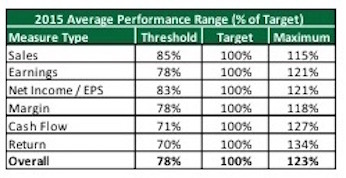 The resulting average slope, which is the percent increase in the payout for each 1% increase in performance, typically results in higher incremental payouts for above target performance (ie, from target to maximum) than below target performance (ie, from threshold to target). Slopes vary widely among measure types and companies, reflecting individual facts and circumstances. The table below shows the 2015 average slopes, which are similar to the 2011-2015 averages (not shown). We analyzed the disclosed formula-based “payouts,” as a percent of target, earned for each financial measure; actual company payouts may be different, reflecting additional measures and considerations applied to determine final payouts. Incentive payouts, by design, are structured to commensurate with financial results relative to target; as such, there is a distribution of payouts. Average payouts were at or above target, with the prevalence of the financial measures earning above target awards (for that measure) at approximately 50% or higher, reflecting solid financial performance. The table below summarizes our findings for all analyzed financial measures. The disclosed formula-based “payouts,” as a percent of target, varied widely for the most prevalent financial metrics analyzed, with particularly broader YOY variances for net-income-based and cash flow measures. Among the 51 companies that used multiple financial performance measures and disclosed the formula-based “payouts” for each measure, the average difference in payouts, as a percent of target, was 48% for 2015 (median: 30%). The range of differences in the formula-based “payouts” between financial measures ranged from 0% (no difference) to 200% of target. During the period analyzed, it was relatively common (prevalence: 63%) to have at least 2 years in which the payouts were substantially different (eg, one measure below target or no payout and the other measure at target or higher). 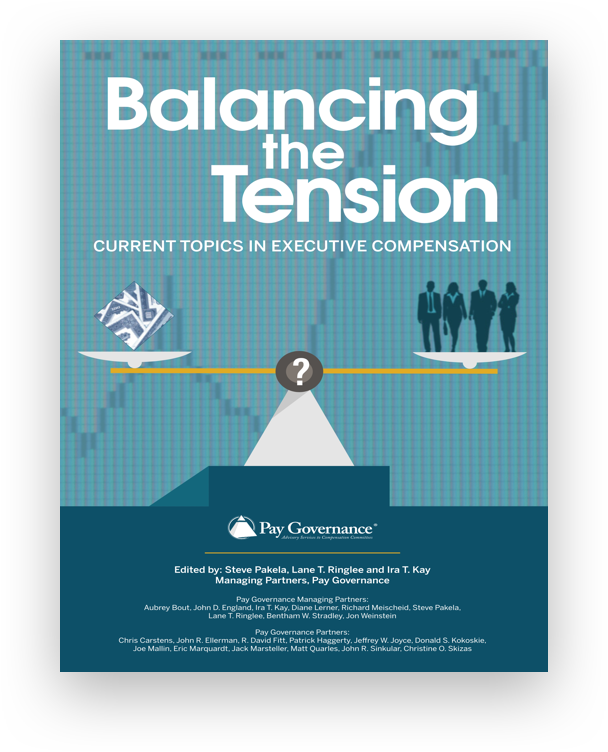 However, such situations may require additional proxy disclosure to ensure clarity regarding the goal-setting process and the alignment of pay and performance. The 98 companies analyzed had at least 2 years of consistent financial performance measures and disclosed most/all of the performance goal ranges and formula-calculated payout for the measure. 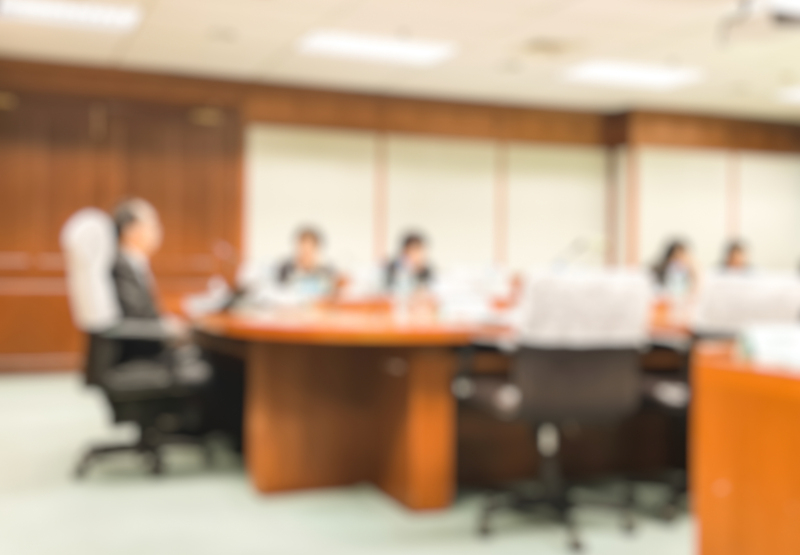 Over 300 companies were considered for the analysis, but many companies had to be excluded due to changing performance measures or limited proxy disclosure regarding goals, ranges, or results. Pay Governance consultants located in our Cleveland, Detroit, and Pittsburgh offices provided assistance with data gathering. 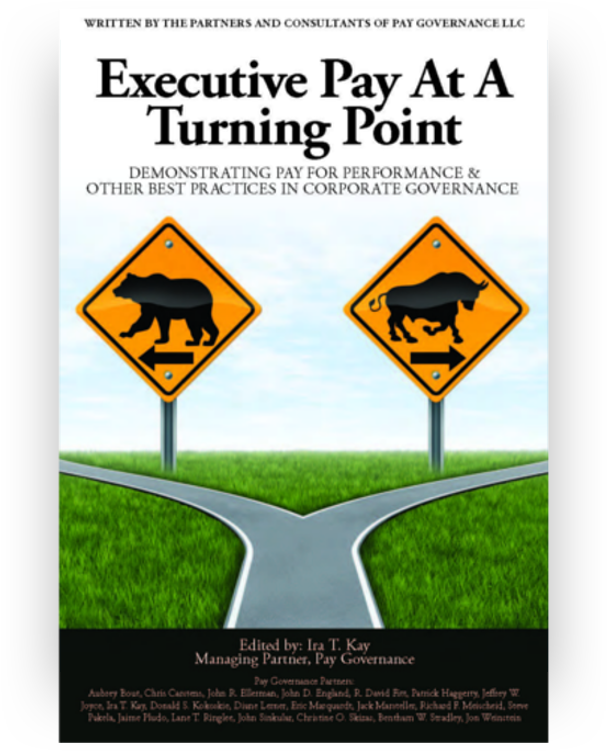 General questions about this Viewpoint can be directed to John R. Sinkular or Julia Kennedy by email at john.sinkular@paygovernance.com or julia.kennedy@paygovernance.com.